’n Sakeman van Rustenburg wat R45 miljoen verloor het weens ’n beweerde slenter, verkoop nou hout in townships om te oorleef. Johan Oosthuizen moes sy seun, Rohan, uit die Noordwes-Universiteit in Potchefstroom haal waar hy gestudeer het om te help met die houtverkopery, het dié pa van drie vertel. Johannesburg - A man from Sandton has been harassed and stalked by an ex-girlfriend to such an extent that he has lost his job and many of his friends. His online profile is not his own and his house has been petrol-bombed. Now Duncan D’Ewes, 37, has become one of the first people to open a case with the police using the Protection from Harassment Act, which came into effect on Saturday – Freedom Day. Numerous other charges against his ex have not led to an arrest. “I don’t know what to do anymore. I had to resign from my job. I can’t have any relationships. She even targets my friends. Nothing is off limits to her,” D’Ewes said. The follow up article is titled "Two sides to story, says alleged stalker". JOBURG - A South African financial crimes investigation crew based in Orange Grove, IRS, will be in action on an international TV reality show. The 13-episode show, named Corruption Busters, will be aired on National Geographic and Discovery channels. The company is led by Gold Medal for Bravery recipient Chad Thomas. He said they have completed corruption investigations throughout Africa. “We also sent an investigative team to Benin to investigate the attempted assassination of the president there,” said Thomas. The reality show is already being recorded. Thomas, the chief forensic investigator, said they were initially reluctant to star in the show, but after they saw the international interest in their craft, they signed up. GEORGE NEWS - The special investigation unit of the police, the Hawks is conducting a high level investigation against a local business, after allegations of Broad-Based Black Business Economic Empowerment fraud to the value of more than R400-million was levelled against the company by a former employee. The police confirmed that a case was opened and is being investigated. "The charges are Contravention of the Broad Based Black Business Economic Empowerment Act and Fraud." "The owner and member of the company under investigation allegedly appointed the complainant as a 50 % partner and member of the closed corporation. Several tenders were awarded to the CC to supply and maintain vehicles to various municipalities based on the BBBBEE compliance of the CC. The complainant allegedly did not have insight into the financial affairs and did not participate in the management of the CC," said Capt Bernadine Steyn, Southern Cape Police Spokesperson. 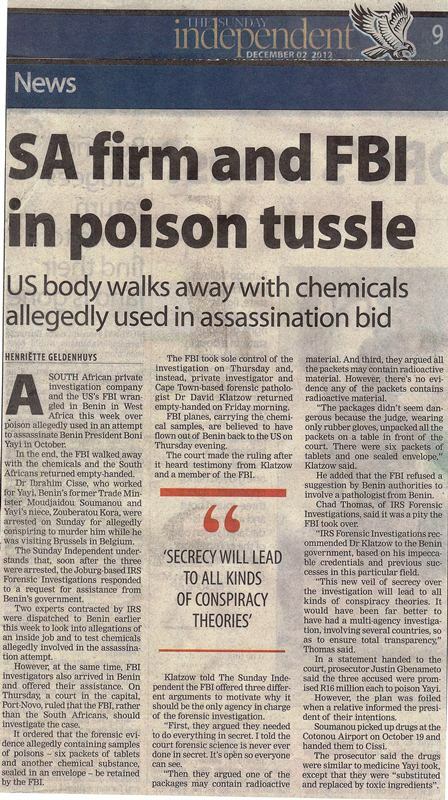 US body walks away with chemicals allegedly used in assassination bid. Afrikaner SAPS officer Bennie Kitching concussed from stone-throwers, 100-strong mob, Rosmead Middelburg East Cape trying to arrest livestock thieves. Afrikaner SAPS officer Bennie Kitching attacked, given concussion by 100-strong stonethrowing mob, Middelburg EastCape: and then his family is threatened by 8 blacks after they drive back from hospital, his daughter reports: -The daughter of SAPS livestock-theft unit officer Bennie Kitching said he sustained a concussion after he was stoned by an 100-strong black mob in Rosmead near Middelburg East Cape while trying to arrest 3 livestock thieves. Merrick Meek, the head of the Bryanston branch of Rawson Properties, has become embroiled in a controversy involving the illegal sale of state land and is being probed by a high-level organised crime task team, led by the Hawks. It's part of an investigation into at least 11 cases involving dealings with state- owned land worth about R1 billion. Meek became an accused party in the investigations after Dimension Data, a Joburg-based global ICT company, laid a criminal complaint in terms of the Prevention of Organised Crime Act (Poca) against Meek at the Sandton police station on Friday, September 14. The Hawks, three members of the Gauteng organised crime office as well as private investigator Chad Thomas from IRS Forensic Investigations, are involved in the investigation. Bank customers have been warned by the SA Banking Risk Information Centre (Sabric) to look out for scams involving payment by cheque. Cheque fraud is on the rise and businesses need to watch out, the centre says. Perpetrators are targeting businesses by approaching them with urgent orders for goods and a promise of payment to be made into the business’s bank account. The promise is often supported by a proof of a cash deposit or electronic payment, but the payment is made with a fraudulent cheque. Chad Thomas, IRS Forensic Services chief investigating officer, said this was the most common type of fraud. Assets worth R4 million will be forfeited to the state on Thursday by a man accused of fraud in Christiana, in the North West, police said. An order to attach the assets of Pieter Willem Van Heerden was issued by the High Court in Pretoria on July 25, said Colonel Emelda Setlhako. Putfontein – Lede van die Batloung-stam wie se grondeis in 2000 geslaag het, het sedertdien glo nog nie ’n sent gesien van geld wat hulle van die regering sou kry nie. ‘n Stuk grond in Ferryvale Nigel, is skerp onder die vergrootglas nadat ‘n private speurmaatskappy van Johannesburg die aangeleentheid ondersoek het. ’n Bedrogskema waarmee onder andere boere in Noordwes glo uit miljoene geswendel is en waarvan die tentakels vermoedelik landwyd strek, word ondersoek. Chad Thomas, hoof- forensiese ondersoeker van die forensiese ondersoekmaatskappy IRS in Johannesburg, het gister gesê van die vermeende slagoffers het sy maatskappy gekontak in die hoop om geld terug te kry wat hulle verloor het. Police and private investigators are looking for a man suspected of two counts of housebreaking. "We believe Lenny Govender may be able to help us in this regard," said Chad Thomas of IRS Forensic Investigations. "The suspect was a police reservist and served in the Hillbrow area in the early '90s. He knows police protocol and he knows the Hillbrow/Yeoville area very well." Investigators believe the suspect moves around Bedfordview, Kensington, Yeoville, Berea, Hillbrow and Orange Grove and is brazen in his criminal activity. Popular nightclub The Voodoo Lounge might offer more voodoo than residents of northern Johannesburg suburb Linksfield can stomach. The club has been built on the edge of council land where Johannesburg buried victims of highly contagious diseases during the first half of the 1900s. 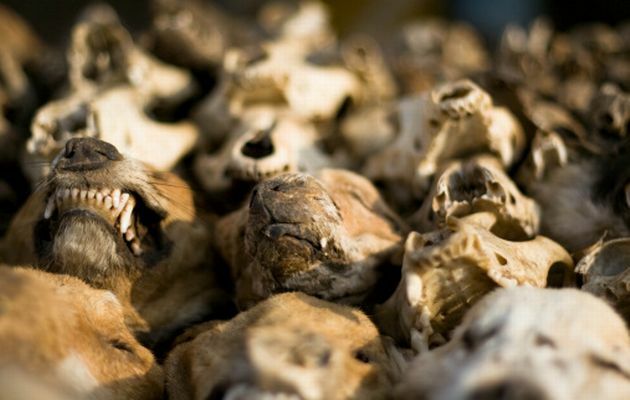 Residents, who already resent the noise from the club, now fear that recent digging and further development might unearth the graves of people and animals that died of ills such as black plague, smallpox, syphilis and anthrax. According to the City of Johannesburg website, about 7000 people are buried in the historic cemetery, originally bought by the Transvaal Republican Government in 1895. Metal markers to indicate graves have been stolen, fuelling fears that development might expose corpses and spark a health crisis.